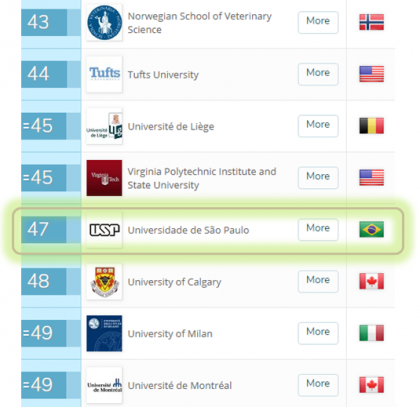 Welcome to School of Veterinary Medicine and Animal Science (FMVZ) of University of São Paulo (USP). We are among the 50 best in the world in the field of Veterinary Medicine at QS World University Rankings. The University of São Paulo is a public university, maintained by the State of São Paulo and affiliated with the State Secretariat of Economic, Scientific and Technological Development. Various world rankings, created to measure the quality of universities according to various criteria, particularly those related to scientific productivity, have widely recognized the talent and dedication of USP professors, students and employees. . In 2018, the School of Veterinary Medicine and Animal Science of University of Sao Paulo (FMVZ-USP) has begun the celebration of the centenary of the creation of Veterinary Medicine course in the State of Sao Paulo, Brazil, and the 85th anniversary of 1934 founding of FMVZ-USP, which will both occur in 2019. To mark this milestone, the School launched a two years-long series of programs and activities to recover its history, since the creation of Butantã Institute in 1917, passing through its rising to College of Veterinary offering a three years course in 1919 and then for a four years course as a College of Veterinary Medicine, in 1928. In 1934 the University of Sao Paulo was founded as a higher education institutions with eight Schools. Thereby, the School of Veterinary Medicine (FMV) was invited to join USP, becoming one of these eight pioneering institutions that created it. In 1957, the Governor of the State, Jânio da Silva Quadros, attending a demand of FMVZ-USP Board, decided to increase its rural areas and allowed a better teaching facilities of animals creation and production, transfering the Institute of Animal Science and Livestock Industries (IZIP) from Pirassununga city to FMV-USP, opening uncountables possibilities to complement the teaching structure created so far. As a result, in 1959 the School of Veterinary Medicine added Animal Science (Zootecnia) to its name, being denominated as FMVZ-USP. In 1965, FMVZ-USP launched its first postgraduation course in Animal Reproduction, one of the first to be created in Brazil. Although had already been structured since 1940s, the Veterinary Teaching Hospital (HOVET) was inaugurated and restructured in 1981 and, over the year new services of specialization were created in many areas, which also helped to increase the number of cases attended. In 1978, FMVZ-USP Board decided to launch a second high education course but in Animal Science, being held until 1992 when its turned out in a new School of USP, denominated School of Animal Science and Food Engeneering (FZEA). In 1990, USP created the Pirassununga Campus, keeping the facilities of FMVZ-USP. In 1988, USP created four Provosts, Graduation, Postgraduation, Research and Culture and Outreach, decentralizing and specializing the structure. A similar structure was implemented in the Schools, called statutory Committees. Regarding graduation, it represented a great advance, since the most varied internal decisions (i.e. curriculum, pedagogical policy) always responding to Schools’ Board could be taken separetely. The Graduation Commission (CG) of FMVZ-USP is composed by faculties from each of its six departments and a student. From these six faculties members, one is elected as President and another one as a Course Coordinator. This change brought to FMVZ-USP agility in the planning and implementation of improvements, in the process of managing the Graduate and Postgraduate Courses and also in the activities related to research and outreach services offered to the external community. The Veterinary Medicine Course offered by FMVZ-USP, has undergone evaluation processes, such as: National Examinations of the Course (Provão) promoted by the Ministry of Education and Culture from 1997 to 2003, obtaining in all the highest grades of excellence. 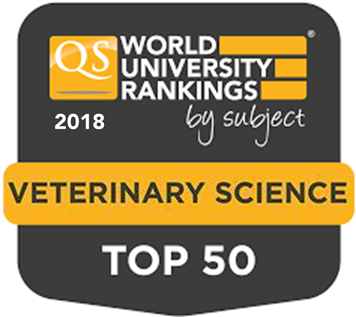 From 2015, has entered in the select list of QS World University Rankings, one of the most important in the academic field, positioning itself between the Top 50 Schools of Veterinary Science, ranking 36th in 2015 and 38th both in 2016, 2017 and again 36th in 2018, being the best classification among all the Latin American Schools and the 2th one in Iberoamerica, behind only the University of Barcelona, in Spain. FMVZ organizes its teaching and research activities in six departments in the USP campus of the Capital and Pirassununga. They are subdivided into laboratories and services in which undergraduate and postgraduate courses are offered, research projects are developed, refresher courses and specialization, professional practices, among others. It develops teaching, research and university extension activities that aim at improving the reproductive efficiency and conservation of the various species, with a focus on management, physiology, biotechnology, pathology and obstetrics of domestic and wild animals. Specialized in canine, feline, bovine, equine, caprine, ovine and avian species, encompassing studies in cardiology, dermatology, hematology, nephrology, neonatology, pneumology, stress physiology, locomotor and digestive system disorders, mammary gland diseases, oncology and nutritional and metabolic diseases of cattle and birds. It develops scientific and technological research in the areas of nutrition and production in the different animal species and collaborates in related areas. It also provides scientific collaboration in research, teaching and university extension to public and private agencies in Brazil and abroad. Here we study the causes and consequences of infectious, neoplastic and poisoning diseases in domestic and wild animals, as well as the maintenance and research in animals kept under laboratory conditions. Its objective is to develop training, research and extension activities, aiming at the solution of national problems related to Animal Health, Veterinary Public Health and Food Hygiene. It develops activities in four major areas: Anatomy, Anesthesiology, Surgery and Diagnostic Imaging. It offers university extension courses, through the five specialized services at the Veterinary Hospital (Hovet), actively participating in the Veterinary Residency Program. The pedagogical project of the Veterinary Medicine Course of the FMVZ-USP details the planning of teaching and learning procedures necessary for the professional qualification, providing a wide range of knowledge that makes the professional capable of working in the four dimensions of veterinary medicine scope, including pets, production, wild animals, public health, as well as its implications on animal food and environmental sanity. “The Course of Veterinary Medicine provides to its alumni a professional profile with a generalist, humanistic, critical and reflexive background, able to understand and translate the needs of individuals, social groups and communities, related to the activities inherent to the professional practices, within their specific fields of action in animal health and veterinary clinics; environmental sanitation and preventive veterinary medicine, public health and technology inspection of animal products; animal science, animal production and reproduction, ecology and environment protection. In addition, has knowledge of social, cultural and political facts of economy, also agricultural and agroindustrial administration. Capacity for logical reasoning, observation, interpretation and analysis of data and information, as well as the essential knowledge of Veterinary Medicine, for identification and resolution of problems”. (iv) To preserve, at the same time, the generalist profile of the course. The traditional teaching/learning programme of Veterinary Medicine courses seeks to contemplate the complete content of this area of ​​knowledge, which is in constant evolution, becoming the teaching/learning process progressively ineffective. In fact, the considerable economic and technological development experienced in recent years by the global economies, among them Brazil, has led to a proportional increase in the creation of knowledge and, consequently, in the new areas of professional activity and demands, not only in the Veterinary Medicine, but in many other sectors. These new demands have been stimulating the development of new fields of work, which has required professionals with a higher level of specialization within already consolidated areas of knowledge. Moreover, the effectiveness of traditional teaching/learning programme has been increasingly questioned not only as a result of the evolution of knowledge in Veterinary Medicine, but also by the labor market pressure that demands increasingly specialized professionals, but at the same time with versatility between different areas of knowledge, many of them outside ​​Veterinary Medicine field. Thereny, FMVZ-USP has been updating its academic structure in order to meet these new demands with excellence, offering a course that is not only forged with compulsory subjects, but that also allows flexibility for the combination of different knowledges according to the needs of the student. From these changes, FMVZ-USP allows the student more time to interact with necessary and complementary fields of action and, at the same time, make possible the more fluid use of the wide range of knowledge available at USP or in other sectors academics or otherwise, in order to build the learning in a more dynamic way, with the effective participation of the student in the achievement of his/her own choices. In this new teaching/learning programme, the student has free times during the week and, therefore, more possibilities for non-compulsory activities during the course. With this approach, the understanding is that the student has great power of choice for his/her graduation in Veterinary Medicine and that the compartmentalization of knowledge is minimized through interdepartmental disciplines that converge competences of several areas, making it possible to meet the goals aforementioned. FMVZ-USP emphasizes that does not intend to bring to its domains all areas of knowledge necessary for professional training, leaving part of this responsibility to the student him/herself. In general terms, about 15% of the course hours are used for activities chosen by the student. The learning/teaching structure of FMVZ-USP Graduate Program is characterized by the combination of activities offered by several USP Teaching Schools. The development of the Veterinary Medicine Course is in charge of six departments of FMVZ-USP and nine departments of other USP Schools. Interdepartmental disciplines are also offered under the coordination of the CG of FMVZ-USP. The Veterinary Medicine Course is presential and ideally composed by 10 semesters. In the first three academic years, área offered subjects of the basic knowledge as Cytology, Histology, Anatomy, Biochemistry, Physiology, Microbiology, Parasitology and Immunology. All these subjects are areas of knowledge required to build concepts for the understanding of biological functions at different levels: molecular, cellular, tissue and organs. The Institute of Mathematics and Statistics (IME-USP), the Institute of Biomedical Sciences (ICB-USP), the Institute of Chemistry (IQ-USP) and the Institute of Biosciences (IB) participate together with FMVZ-USP to offer this wide range of knowledge to FMVZ/USP students. The interaction of FMVZ-USP students with other USP Schools constitutes an important opportunity to universalize knowledge, since the students interact with students from other courses, such as Medicine, Dentistry, Biology, among others. In the 4th year, the student start to have contact applied learning/teaching structure core, when they have opportunity to learn about methods of work and other unique abilities of a Veterinarian. In the 5th year, the student stays a semestre in FMVZ-USP Fernando Costa Campus, in Pirassununga city (also in São Paulo State) where they can live in free student housing offered by USP, to learn about Animal Production. During this semestre, the Animal Production teaching is complemented with subjects of Animal Reproduction, offered immediately before and immediately after this 5th semester, since in this campus there is an infrastructure dedicated also to this subject (i.e. poultry, stables, swine, slaughterhouse, dairy, feed mill, animal breeding laboratories, beef cattle production). The learning about animal species of production, their maintenance, reproduction and sanity, constitutes primordial aspects for the improvement of the performance of the productive chain of meat and milk. That way, it is necessary that the appropriate scenario for this learning be the rural environment, which is provided by the Campus USP Fernando Costa. For this reason, this campus becomes essential for part of semester 4th and for 5th and 6th semesters. Returning to USP São Paulo Campus during the 6th semester, students learn about Animal Reproduction and Preventive Veterinary Medicine. The 5th and 6th semesters are dedicated to contextualized teaching in the population approach. In the 7th and 8th semesters, disciplines related to the medicine of individuals are offered, mainly represented by the subject of Clinic and Surgery of Domestic Animals. At the USP São Paulo Campus, FMVZ-USP students have laboratories and hospital facilities for all disciplines that require these resources. Throughout the course, in all the subjects taught in São Paulo, excursions are planned for the FMVZ-USP facilities at the USP Fernando Costa Campus, to allow the students to practice activities realted to animal production. These excursions generally last one week and take place during disciplines related to the areas of Clinic, Surgery, Pathology, Animal Reproduction and Preventive Veterinary Medicine, in order to provide an integrative overview of this knowledge. At the end of the first 4th years, the student begins the 9th semester, when he/she must choose to attend at least one of a list of ten elective subjects and among these disciplines it is offered the subject called Supervised Curricular Internship, in which it will be possible to look for na institution for practicing the knowledge obtained during the graduation course. The Supervised Curricular Internship (workload of 480 hours) is the last activity/subject of the student graduation, held under the supervision of one of FMVZ-USP faculties members. Finally, the teaching/learning structure, besides of attending legal aspects, guarantees a general education, but at the same time seeks to reconcile, either by offering elective courses and by creating “green areas” (free time), possibility a flexibility to the student seeking knowledge and skills autonomously in the areas of greater affinity within what Veterinary Medicine has to offer. In 1973, FMVZ USP was a pioneer in Brazil in offering a postgraduate course in Veterinary Medicine. FMVZ Graduate is stricto sensu, of a more academic nature, and aims to train masters and doctors to meet the demand of the public and private sector. The researches involve new problems and the proof of new theories. It comprises a set of activities programmed and accompanied by a counselor. Being able to be a scholarship holder of development agencies. The journal aims to publish full articles, preliminary notes and review articles in the fields of veterinary medicine, animal science and allied sciences, prepared by national and / or foreign, provided that meet the editorial standards. The platform gives access to the scientific, academic, artistic and technical production of researchers, plus the theses and dissertations defended since 1985. Provides the complete digital version of theses and dissertations defended in master’s and doctoral programs of the University. The Veterinary Teaching Hospital (Hovet) of FMVZ USP plays an important role in supporting teaching, research and extension. Built less structured since the 1940s, it was inaugurated and restructured in 1981. Hovet consolidates a fundamental partnership between hospital care and undergraduate and postgraduate courses and specialization courses, as well as the residency and professional improvement programs of the Faculty. Currently, it is considered the largest university veterinary hospital in Latin America in relation to the number of cases attended, pioneering the offering of medical and surgical specialties in Brazil. It gathers the services of all departments of the Faculty, offering care in various areas, for pets, production, equines, wild, exotic and birds, focusing on cases of didactic and scientific interest. Established officially in 1984, and restructured in 2010, the Museum of Veterinary Anatomy Prof. Dr. Plínio Pinto e Silva (MAV) is an integrating organ of FMVZ USP. Its mission is the development of research activities, teaching and extension services to the community, in the different areas of Veterinary Medicine and Animal Science, with emphasis on animal anatomy. It presents in its long-term exhibition about one thousand copies prepared and preserved in different techniques by professors, servants and students of FMVZ-USP over the years. The MAV is the first museum of USP and one of the first in Brazil to systematically provide images of its collection in high resolution and totally free on Wikipedia from an institutional partnership. Currently, the Museum receives more than 12,000 visitors annually, with about 75% composed of school groups, which corresponds to an average of 250 schools per year.